Last week I was swotting up on ICTs in the Sustainable Development Goals for an interview. least developed countries by 2020”. Using indicators of ICT access as a proxy for development is problematic. It is entirely possible for ICTs to be universally available to everyone in a specific population whilst at the same time as levels of well-being, health and freedoms decline. The UK and USA are examples of countries where indicators of mobile and internet penetration have rapidly increased at the same time as economic depression, and expansion in health and income inequalities. With all of the hype that exists about digital development, it is easy to forget that – as this live internet user count illustrates – the majority of the world's population are NOT internet users. Even where availability exists there are many barriers to effective use. 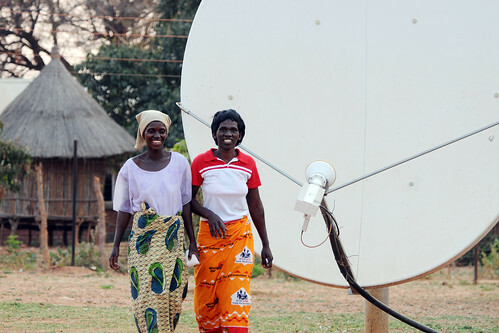 Translating ICT access into valuable development can be problematic on a number of levels. Availability: In many remote rural communities the internet is simply not available; there is no cable or cellular internet coverage and satellite connectivity is prohibitively expensive. In these areas digital development initiatives need to concentrate on innovative connectivity strategies in order to achieve universal coverage. Affordability: In other places cellular coverage exists but the costs are so high in relation to local income levels that access remains unaffordable for many. To make things worse it is often in countries with the lowest levels of income that connectivity is the most expensive, as these charts illustrate. Government regulation of telcos can be effective in driving down the costs of access. Awareness: Even where access is available and affordable low levels of awareness may be a barriers to people using internet access to improve their well-being and development. If people do not know that the internet is available or do not know in what ways it might be relevant to their life or interests then access itself is not equal to valued development. Infomediaries and public education programmes have been effective in tackling awareness barriers. Accessibility: To people aware of the potential benefits of using the internet, accessibility barriers may put them beyond their grasp. The absence of adaptive technologies for people with disabilities means that millions of blind and visually impaired people are denied access to the internet. For others the lack of web content in their own language – and the absence of locally relevant content – mean that they are unable to translate internet availability into development outcomes that they have reason to value. Ability: Appropriate user skills are necessary to translate ICT access into valued development. Comprehensive digital literacy should be core to all digital development programmes. Often ICT4D interventions provide narrow user skills training but neglect the wider critical literacy skills. I argue that where the development objective is that disadvantaged people are better able to understand their own situation, and themselves devise and take action to improve their situation then it is important to complement participants' technical skills by enhancing their 'critical-agency'. The regular reader of this blog (thanks mum!) will know that I define 'critical-agency' here and bang on about its importance to theories of change in digital development here. Permalink Submitted by Mario Marais (not verified) on 31 May, 2016 - 10:57. Wow! Our experience has been that change management to develop and support agency is critical! Kleine's Choice Framework is useful since degrees of choice (Allison's work) and Sen's capability approach. More at our project website www.ict4red.co.za. I've also published some work on Sustainability in ICT4D. See www.mariomarais.org. In South Africa, large scale deployment of tablets are happening in schools in Gauteng and the five As are definitely required especially for teachers! As is adequate support systems for ongoing learning to support teacher agency and plain old technical support. The Loch Ness Model: Can ICTs Bridge the “Accountability Gap”?